HGE has been in the business since 1967. The company was formed when H.W. (Bill) Howard bought a used Webendorfer and took up residence in a 250-square foot section of a friend’s machine shop. Prior to forming the company, Bill worked as a pressman in his native England before emigrating to Canada in 1947. It was in Canada that Bill continued his involvement in the industry selling a variety of new machinery, including Heidelberg, Wohlenberg and Miehle Roland. Many moves later and with the addition of other family members, HGE now carries on business in a 98,000 sq. ft. specially designed facility in Mississauga. The word “RECONDITIONED” is used widely throughout industry. What does it mean to me - the customer? Using the strict guidelines based on the HQS Quality System, HGE ensures that machines leaving our plant have been brought up to proper standards especially in the area of cylindesr, bearings, thrust bearings, grippers, infeed, pads, delivery, cams and followers, feeder, ink units, and water units to mention a few. The HQS Quality System is a result of many years of refinement and leaves little doubt as to the outcome. Anyone can make up a simple checklist, but we have gone further in order to make our work meaningful. 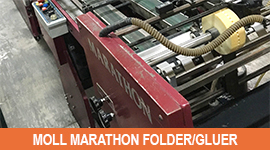 We also invest over 1000 man hours in each 6 color 40"we take on. This labor element allows us to check, replace, reset or repair components and, in so doing, print test each machine to ensure that we have, indeed, got it right. After the machine is delivered, we then have the possibility to scrutinize our performance and continue “refining” the HQS protocol in order to enhance its value. How does HGE compare with the industry? We suggest that our clients answer this question. If the competition is able to offer facilities and the resources to operate a meritable reconditioning program then they should be able to demonstrate this to prospective purchasers. We are very proud of the over 4400 press units, which includes virtually all major makes of presses - Heidelberg, Komori, Roland, Mitsubishi - that have been supplied to over 74 countries around the world. We encourage any buyer to ask for our video or arrange an on site visit to see first hand what the printing industry has been buzzing about - HGE! Is HGE reconditioned equipment more expensive? With an over abundance of brokers operating in our field, this question is certainly justified. HGE uses its financial resources to move in quickly when the right machine is available. Instead of “marking up a profit percentage”, we negotiate a much better price as we buy for stock. Howard Graphic Equipment is very competitive in price and more importantly quality. For other questions, please don't hesitate to contact us - we would be pleased to provide you with the answers.